Our family-oriented Holy Cross Birthing Center offers an innovative birthing concept that is as close to home as you could wish for. 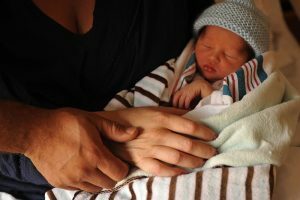 Holy Cross Hospital’s Birthing Center has the comforts of a homey environment, with an emphasis on keeping the delivery of babies as comfortable as possible. We provide the best medical expertise and technology, assuring the safe and healthy birth of your child. As an expectant mother, you will be in one of our three home-like rooms with a comfortable birthing bed, hardwood floors, a rocking chair, plenty of sunlight from a large window and ample room for your family to visit you and your new baby. When delivering your baby, you will remain in this environment for labor, delivery, recovery and postpartum care with experienced, professional, and compassionate nurses. Our Holy Cross Birthing Center offers centralized fetal monitoring which allows both nurses and physicians a method of monitoring the mother and unborn child’s condition. The nurse’s station and birthing or labor and delivery rooms are able to analyze the baby’s status for signs of fetal distress at any time. A nursery for newborns requiring extra assistance is just a few steps away from the birthing rooms. There is also a triage room to assess urgency of need by expectant moms just coming in to the labor and delivery area. Expectant moms and dads are welcome to come by, tour the HCH Birthing Center, and meet our experienced nurses.